Interior of the National Historic Landmark, Charles Gates Dawes House. Docent led tours take place at 1pm, 2pm, and 3pm Thursday through Sunday. The Dawes House is occasionally closed for tours, please consult the calendar (at right) before planning your visit. No reservations are necessary. Tours runs approx. 45 minutes. Every first Thursday of the month is free! 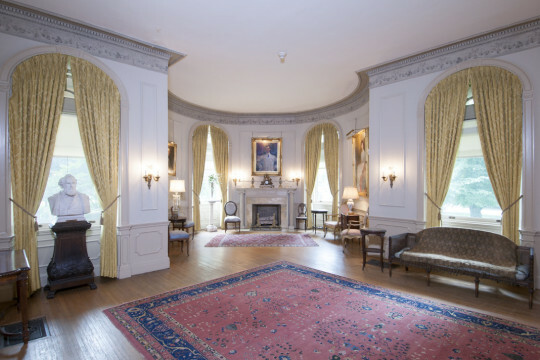 Admission to the Dawes House includes a tour of the historic home of former Vice President Charles Gates Dawes, entrance to the permanent exhibit on Evanston history, Milestones & Memories, and exciting specialized exhibits on Evanston history. The interior of the house is only viewable by a docent-led tour. The tour includes all of the first floor and part of the second floor. Free street parking is available on Greenwood Street. The Evanston History Center is mostly wheelchair accessible. There is a wheelchair lift on the driveway and a ramp into the house. The second floor has limited accessibility. An elevator goes to the second floor and basement, it does not accommodate modern wheelchairs. There are 6 stairs up to the front door with railings. For additional information or specific inquiries, please call 847-475-3410. For guests’ comfort, the Center does have climate control throughout the year. Photographs are for personal use only and may not be reproduced or sold without the written permission of the Center. Only non-flash photography is permitted.